You can expect to find a joyful body of believers from all age groups and various backgrounds who enjoy fellowship together before and after each service. God has richly blessed us with an atmosphere of grace and friendliness. Stop by our welcome center for a cup of coffee or tea and a breakfast treat on Sunday mornings between Sunday School and the morning service. As for dress, please just come as you are. 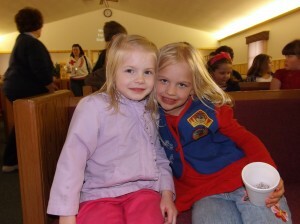 We offer children’s church during the morning service for kids age four through 2nd grade. Our nursery is available for your infant and toddlers up to age four. All our children’s ministry workers are screened and ready to serve. Classes are offered for adults and children of all ages. Classes end by 10:45 a.m. to allow time for fellowship and preparation for our morning worship service. We begin our service with songs that turn us toward God, are rich in theology, and exalt Jesus Christ. You can expect a balanced blend of songs and hymns, both old and new, led by a piano and acoustic guitars and singers of all ages. Following 20-25 minutes of God-centered music, we devote 35-40 minutes to expository preaching from the Bible. This means we will usually be teaching one paragraph at a time through a book of the Bible. Our preaching seeks to explain the original meaning of the text and then apply it to our lives today. Our Sunday evening services are more casual and designed to enhance the spiritual growth of our church family. Sometimes, communion will be the focus of a Sunday evening, or the teens may lead the entire service, or you might hear a Bible message presented by one of our members. Sunday evenings are also when our teen youth group meets (6:00-7:00 p.m.). On Wednesdays, we meet for a more informal time of study through a book of the Bible and then a time of corporate prayer. Don’t worry – we won’t call on you to pray, unless you want to! During the school year, we also offer a Kids’ Bible club for those age four through sixth grade.